Use Perfect Property to find your next perfect house to buy in Chapelizod. Chapelizod is a charming town located 6.2km west of Dublin’s city centre. It is about a 15-minute drive by car via the R148 and M50 Motorways. A number of Dublin Bus routes primarily service the area. Chapelizod is a unique place to live because it sits at the River Liffey, Phoenix Park, and the ridge of Palmerstown hills. Chapelizod homes are a mixture of Period styles, 1970’s era, and newer construction. Residences are treated to views of: beautiful riverside, verdant parkland, rolling hills, leafy terraces, blossoming gardens, mature trees, and magnificent shrubbery. 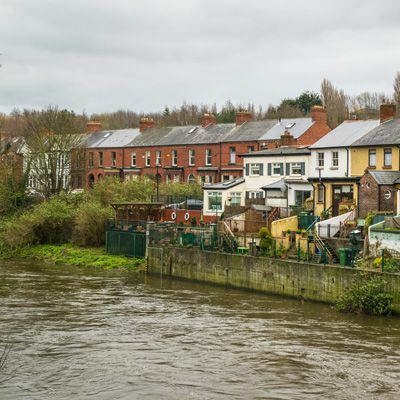 Chapelizod homes retain old-world charm and character, and one can expect to find styles of: Victorian, Mid-Century, Terraced, country, cottage, modern, and contemporary. New construction and refurbished dwellings are equipped with: modern amenities, tasteful décor, spacious living quarters, and sustainable energy efficiency. Chapelizod is a walkable town, with many homes in walking distance to local attractions. Chapelizod is outfitted with a quaint Village centre, and in close proximity are the Liffey Valley Shopping Centre and Ballyfermot. These centres provide ample: retail shopping, supermarkets, convenience stores, auto dealerships, banking, post office, health care facilities, and small businesses. Chapelizod has a small number of restaurants and pubs, including: The Mullinger House, The Angler’s Rest, and The Villager Pub. Due to its great location, Chapelizod offers many opportunities for exercise. Phoenix Park provides endless recreation, sport, leisure, walking, cycling, and picnicking activities. The Liffey also offers kayaking clubs and fishing spots. The neighbourhood is rich in sporting clubs, including: Donore Harriers Athletics Club, Longmeadows pitch and put, Gaels-Drumfinn Avenue park, and De La Salle GAA Club. Local Gem: The Angler's Rest in Chapelizod has been serving delicious Irish food since 1865. The welcoming atmosphere and prime location next to Phoenix Park, make this a must-visit restaurant! The Angler's Rest has also become an increasingly popular wedding venue, providing a picturesque location and fine food, particularly the Phoenix Room which caters for up to 150 guests. Chapelizod is host to a number of well-regarded primary schools. There are no secondary schools in the immediate area. Academic excellence is a top priority, and school awards include: Dr. John Fleetwood Student Award, Kids for Wish Schools Awards, and Mission Possible- School Achievement Awards. You can filter Chapelizod properties by price, bedroom size, square footage and more. There is also the option to filter by a property must-have, such as a garage if you are seeking a house to buy in Chapelizod where you can securely park your car, or even an ensuite bathroom or back garden. You can also check apartments for sale in Chapelizod if you are looking for something a little smaller. Don't let the perfect apartment, townhouse or house for sale in Chapelizod get away. Looking to rent in Chapelizod? Search houses for rent in Chapelizod and filter by home types, price and size.